A food blog from Northumberland, UK. Here you'll find a melange of musings sprinkled with a dash of short stories all served up with a large helping of recipes. 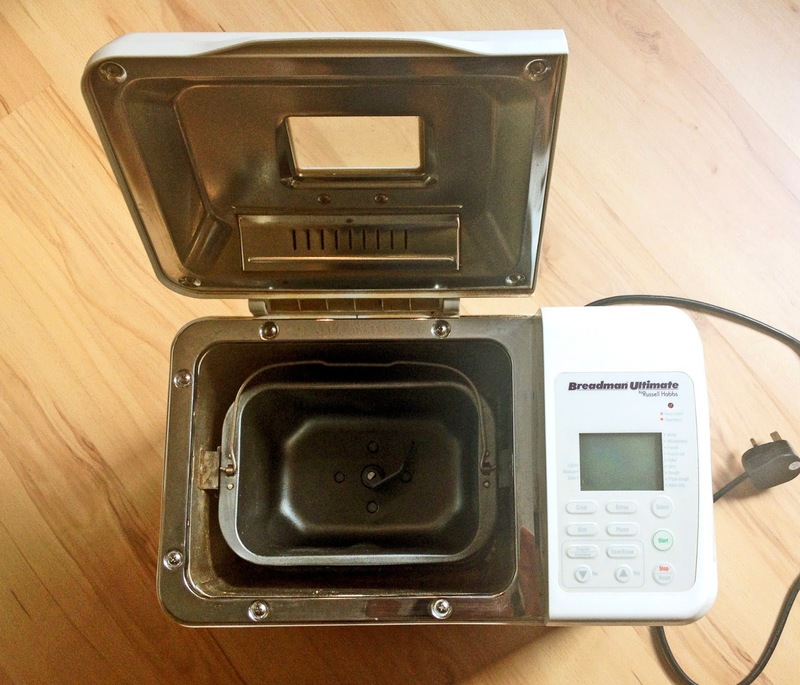 One of my favourite gadgets in my kitchen (and I have a few) is my bread machine! I've had it for years now and it's definitely seen better days but it still turns out lovely loaves time and time again with very little effort. I use it nearly every week and, even though it's not the most stylish contraption in my kitchen and it makes a weird clanking sound when it mixes, I'm loathe to replace it until it has given up the ghost completely. Even when I'm feeling a bit creative, I'll put it on the 'dough' setting so I can shape it into rolls, batons or anything else I fancy and the finished result is always fantastic. Let's be clear though - man had been making bread for millennia before bread machines came along so a machine is obviously not an absolute necessity. For me, the real secrets to making good bread are a good basic recipe, lots of kneading (by hand or machine) and a warm place to rise (which for me is the airing cupboard). Over the years I've tried lots of different recipes with varying degrees of success but the one I've detailed below I have found to be the most reliable that always turns out light, fluffy bread. I used this recipe to make the Parmesan, tomato and basil rolls pictured and have explained how to vary the basic recipe in my notes. Notes: To make Parmesan, tomato and basil rolls add 50g of grated Parmesan cheese to the ingredients at the start then add 40g chopped sundried tomatoes and 2 tsp chopped basil at the kneading stage - knead these ingredients into the bread well to ensure they are evenly dispersed throughout the dough. Other than that, just follow the recipe and timings below. If using a machine, there may be a setting to add 'extras' - this should be selected to ensure that it adds the tomatoes and basil at the right point to prevent them from becoming chopped too small by the machine. When using a machine always check the consistency of the bread during the early stages of kneading. If the dough is too dry add water 1tbsp at a time; if the dough is too wet add more flour 1tbsp at a time. 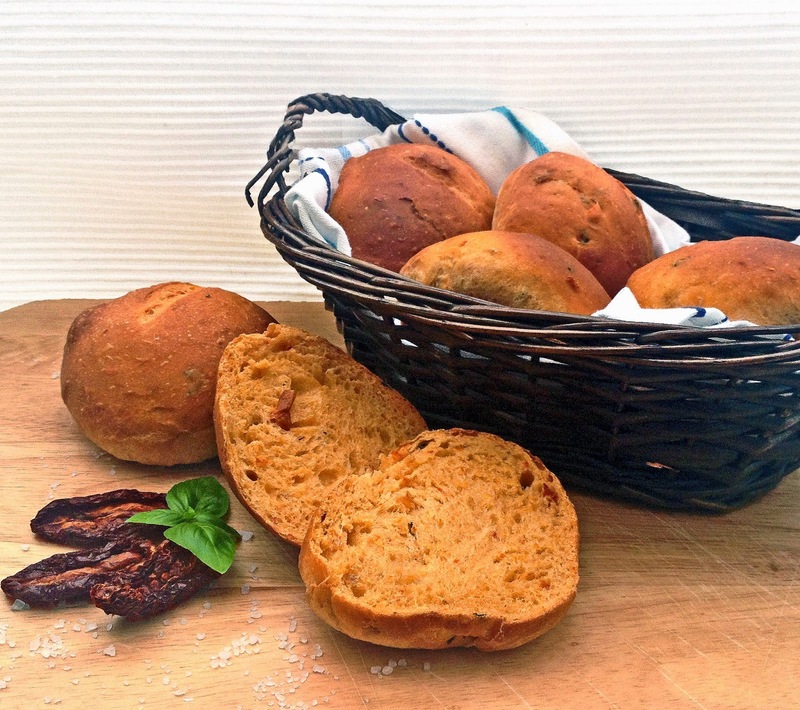 Makes 1 medium loaf approx 750g (1½ lb) or 8 bread rolls. 1. Add the water, oil, sugar and salt to the tin of the bread machine. 2. Spoon in the flour and sprinkle the yeast on top. 3. Set the machine according to the size of the loaf, start the machine and allow the programme to run. If you plan to shape the dough by hand and finish it off in the oven, set the machine to 'dough' and when the programme has finished continue from stage 3 below. 1. Put the flour into a bowl and stir in the sugar, salt and yeast. Gradually mix in enough of the warm water until it forms a soft dough. 2. Turn the dough out onto a floured surface and knead well for at least 5 minutes - the dough should be smooth and stretchy. Put the dough back into the bowl, cover with a clean tea towel or oiled cling film and leave in a warm place for approx 1 hour, until the dough has doubled in size. 3. Turn the well-risen dough out onto a floured surface and knead gently until smooth. At this stage either place into an oiled loaf tin or shape into rolls, batons etc and place on an oiled baking sheet. Cover with lightly oiled cling film and allow rise in a warm place for a further 30 minutes. 4. Bake whole loaves in a preheated oven at 200°C / 400°F / Gas Mark 6 for 35 minutes. The loaf can be covered with foil after 20 minutes to prevent it from burning if necessary. For rolls, reduce the cooking time to 10-15 minutes. 5. Remove from the oven and transfer to a wire rack to cool. Phew! It's been hot this week and I've been trying to spend as much time outside as possible to make the most of this spell of gorgeous weather. 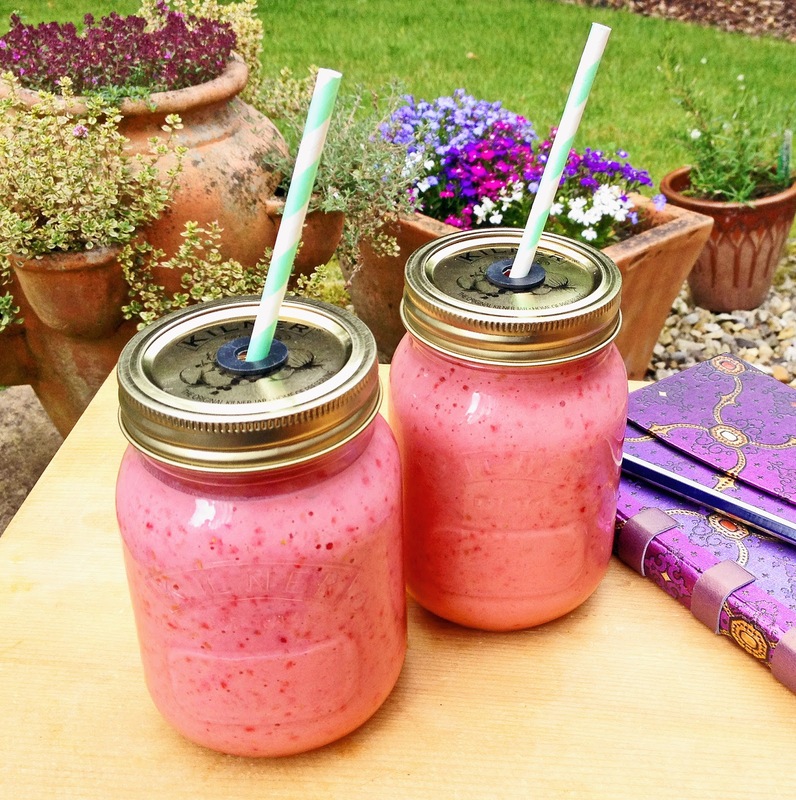 These lovely sippy cups made from Kilner Jars were my daughter's idea and are brilliant for sipping a cool smoothie, fruit juice or cocktail from while lounging in the garden. I love them because there's less chance of spillages and she loves them because they greatly reduce the chance that insects of the winged variety will inadvertently find their way into her drink! Kilner Jars are ideal for this purpose as they're made from thick glass and are therefore nice and sturdy so great for outdoors but really any kind of jar could be used. Kilner is a UK brand of glass jar but if you're from North America I think Mason Jars are the nearest equivalent. Kilner Jar sippy cups are really easy to make so feel free to check out my daughter's blog to find out how. On the subject of smoothies, I couldn't let this opportunity pass without sharing a couple of delicious recipes. Both of these recipes make 2 large smoothies. Notes: I found this recipe on Driscoll's website. They have lots of great recipes using raspberries, blueberries, strawberries and blackberries so is worth checking out for some great ideas. I have reproduced the recipe below in the quantities I made it with using metric measures. 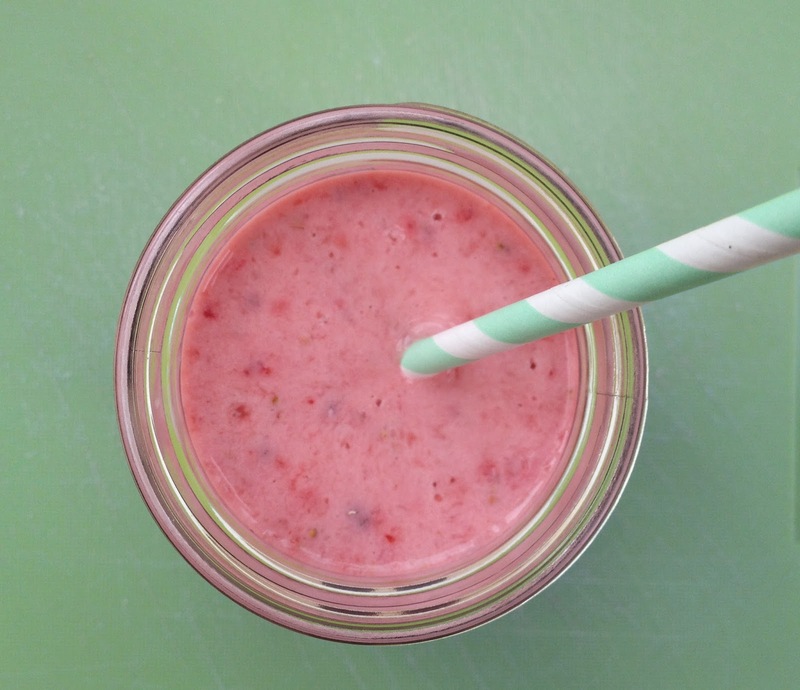 The finished smoothie has a lovely berry flavour with a hint of ginger. As the yoghurt is quite bitter I think it needs the honey to add sweetness but by all means, make it without and then add at the end to taste. Put all of the ingredients into a blender or food processor and blitz until smooth. 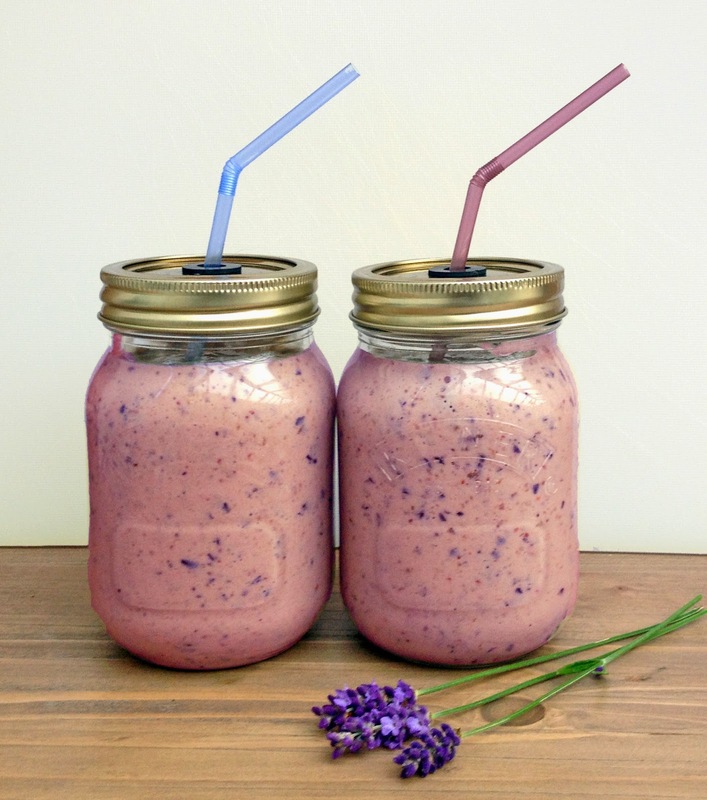 Notes: The lavender that's added to this smoothie adds a fragrant aftertaste but feel free to omit if preferred. I've added 2 teaspoons of honey which I think gives the smoothie a nice sweet touch but, as with the strawberry one above, feel free to leave it out and add it at the end if you think it needs it. I envy those of you who live in warmer, sunnier climes who can plan a barbecue weeks ahead and know there's a good chance that when the day arrives you won't be stressing about the weather and constantly scouring the sky for rain clouds! As the weather here in Northumberland can be a tad unpredictable, in our house our barbecues are usually planned a maximum of 2 hours in advance when we're sure it'll stay warm enough and dry enough not to be worried about whether we'll be cooking in our raincoats. It's then a case of dashing down to the supermarket to get barbecue supplies when, more often than not, everyone else in the neighbourhood has had the same idea so inevitably, burger buns, charcoal and any kind of meat that can be cooked over hot coals has already been snapped up. Because of this, we don't have barbecues very often so when we do I always like to make an occasion of it and have a nice dessert to finish off. 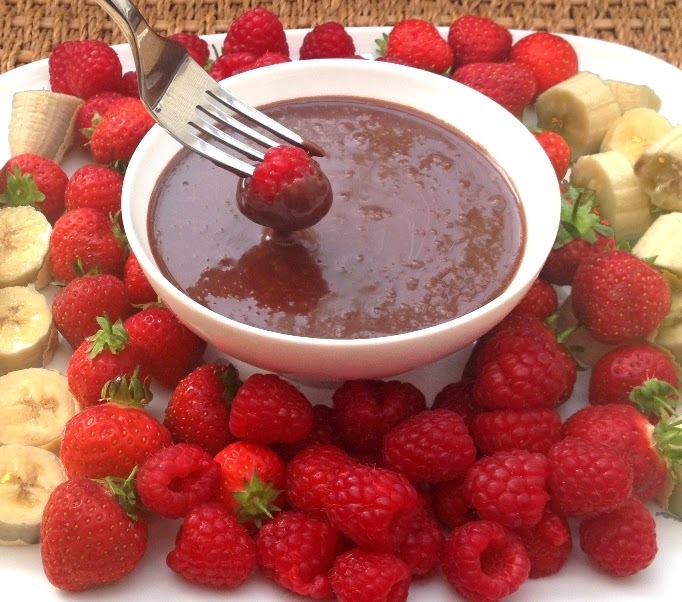 This one is delicious - a bowl of chocolate sauce with a selection of sweet, juicy fruits to dip in it - and is so quick and easy that I don't need to spend hours in the kitchen and miss out on all the fun! Also, as it can all be served on one plate with a fork (or even a wooden skewer) for each guest to use for dipping it saves on the washing up too! Notes: This makes enough for 3-4 people to dip with around 750g of fruit. To increase the quantity is simple - just use the same weight of chocolate to volume of cream i.e. 100g chocolate to 100ml cream, 150g chocolate to 150g cream and so on. If your making this only for adults, 1-2 tsp of liqueur could be added, for example Cointreau for a chocolate orange sauce, Amaretto for an almond flavour or Tia Maria for a mocha sauce. For the fruit, raspberries, strawberries and banana are my favourite but other fruit such as mango and orange segments are also nice. Shortbread is a lovely option too. Selection of fruit or biscuits for dipping. 1. Place a bowl over a pan of simmering water, making sure that the water is not touching the bottom of the bowl. 2. Break up the chocolate, place it in the bowl and warm it until it begins to melt, stirring occasionally. 3. Once the chocolate has melted gradually add the cream, stirring well to allow the mixture to form a smooth, silky sauce and to enable it to warm through. 4. If using, add the liqueur and stir this into the sauce at the end. 5. Pour the sauce into a bowl and arrange a selection of fruit or biscuits on a large plate. Provide forks or skewers for dipping. Malt loaf - dark, sticky, and chewy! 2014 Helen Brass. Simple theme. Powered by Blogger.